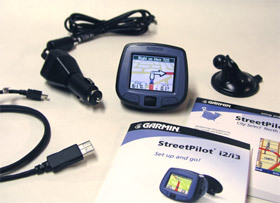 The Garmin StreetPilot i3 is a very small, inexpensive automotive GPS that will appeal to the first-time navigation system user. It’s about the size of a baseball, perhaps slightly smaller. The only controls on the i3 are a power button, a click-to-enter scroll wheel, and a ï¿½backï¿½ button. It provides voice-guided, turn-by-turn directions through its built-in speaker, and the unit easily moves from vehicle to vehicle. It mounts to the windshield or any smooth surface with a suction cup mount or the supplied adhesive mount disc. The StreetPilot i3 comes with a MapSource City Select North America DVD. On this DVD is mapping detail of the entire United States, Canada, and Puerto Rico complete with almost six million points of interest including hotels, restaurants, gas stations, and attractions. 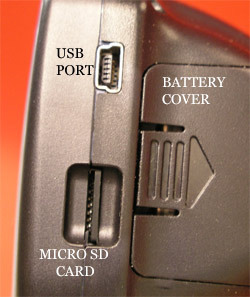 Users load the City Select data onto an included 128MB Transflashï¿½ data card via a fast USB connection. The Garmin StreetPilot i3 GPS receiver, MapSourceï¿½ City Select DVD with Unlock Certificate, Vehicle Suction Cup Mount, 12-volt Adapter Cable, PC/USB Interface Cable, Owner’s Manual, Getting Started Guide. Optional accessories: Remote GPS Antenna and antenna mounts, Deluxe Carrying Case, MapSource CDs, Automotive friction mount, microSD memory cards. As mentioned above, the StreetPilot i3 has only 3 controls: power on/off, “back,” and the scroll wheel. The Main page has three choices: “Where To?,” “View Map,” and “Settings.” On the Where To? page you have choices such as Go Home; Address; Food, Hotels, and More; Recent Finds; and others. Food, Hotels, and More has categories such as Food, Fuel, Lodging, Shopping, etc, and also “Spell Name.” Spell Name allows you to enter each letter of the name of the location you are seaching for and will list the destinations as you spell. You often will not need to spell the whole name. Whether you’ve chosen a category or spelled the name, you then choose the destination. 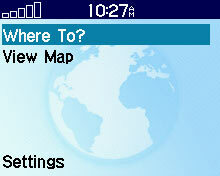 The next page asks if you want to Start Navigating, Show Map, or Save as Favorite. If you choose Start Navigating, the next page is a map showing the upcoming turns. And of course there is voice guidance along with text directions displayed on the screen. 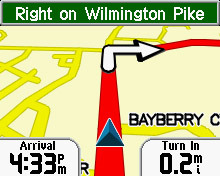 The screen also shows time of arrival and distance to the next turn. If you depart from the original route, the i3 recalculates and gives new instructions. When you are following a route on the map, you have the choice to “Review Turns.” This allows you to see a list of all turns on the route and the distance between turns. The Detour function calculates a new route if you have to make a detour. If you need to add an unplanned stop to your route, the i3 can do this, too. After your unplanned stop, it will resume the planned route. 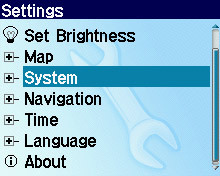 You can customize the i3 by changing various settings such as volume, contrast, and brightness. The map settings can be changed to show more or less detail. Map view can be set to “Track Up,” “North Up,” and “3D.” With system settings you can choose color mode. The choices are Daytime, Nighttime, and Auto. Auto switches from Daytime to Nighttime automatically. WAAS can be turned on or off. The Attention Tone, which sounds before voice prompts, can be turned on and off. Avoidances allows you to select the types of roads you want to avoid and with Route Preference you can tell the i3 to calculate the route by faster time or shorter distance. You can even specifiy your type of vehicle to optimize routes. In my review of the Garmin Quest I mentioned how small it seemed. Well, the i3 is small, too. It’s definitely narrower – just a little deeper than the Quest. The setup DVD was easy to use and all went well (mostly). When choosing which maps to load onto the i3, I was presented with a very small scale map. When I hovered my mouse pointer over approximately where my location was, I wasn’t sure if I had the right area, the scale was so small. When hovering, the PC’s screen displayed major cities but if you’re between major cities, you just have to guess. It turns out I guessed correctly. The i3 accepts 2 AA batteries (not included). The i3 comes with a suction cup mount that will hold to any smooth surface. These in the past have proven to be adequate, and this one is no different. 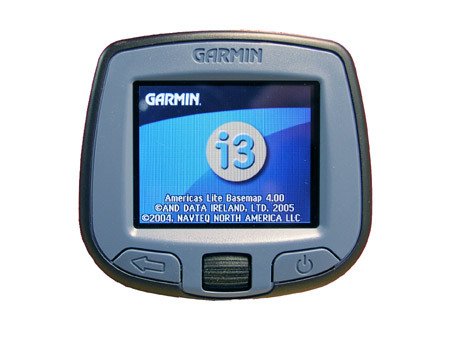 Garmin also includes with the i3 package an adhesive disc that provides a smooth surface for the suction cup. You can, for instance, stick it on your dashboard since dashboards usually aren’t smooth. From the main screen I highlight “Where To” and press the scroll wheel. From the next screen I choose “Address.” If the maps you loaded onto the i3 cover more than one state, the next screen will ask you which state. After that, I have the choice to select a city or spell out the name of the city. Once the city is selected, you enter the number, then the street. At each of these steps the unit will list applicable entries as you spell. An example would be spelling “Columbus.” After I spell “c-o-l” it shows Columbus on the screen. So, you seldom have to spell the whole word which is nice because the scroll wheel is a little tricky to use. But like most things, you get used to it. Next comes navigation. The i3’s route calculation is slower than other models due to the limited processor. One calculation took about 10 seconds. Your route is marked by red on the map with a triangle showing your current position. When I first saw the i3 with its small screen size I was concerned about not being able to see enough of the map to navigate easily. One thing that helps is the fact that the map automatically scales up the closer you get to your turn. I was also concerned about being able to see small details on the screen from a normal distance. 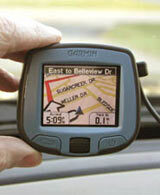 Somehow, Garmin designed it so that following its navigation is easy. The volume and clarity of the voice prompts were very good considering the size of the i3. Another pleasant surprise was that the screen was visible in direct sun. I found this unit to be quite easy to use. I knew a shortcut from what the unit calculated and as soon as it detected that I was off route, it re-calculated to my shortcut. Being a basic receiver, it does have its limitations. However, for someone just beginning, itï¿½s a great value. It appears to be a sturdy little unit and Garmin is known for quality products. Garmin also has responsive technical support.